Stockholm is - although the capital of Sweden - a quite comfortable, cosy, green and safe town with lots of water. It can be everything between the paradise for people adicted to shopping to the green environment where you just can have long walks at the waterside. It is the "Beauty on Water"
And the water is all around the archipelago of 24.000 islands and rocks (most of them are unihabited), protecting Stockholm from the Baltic Sea. This mass of waterways encourages the use of boats by the inhabitants, so in summer you can see tenthousands of sailing or motor boats around. (Hard in winter, when a up to 20cm thick ice layer covers the water of the archipelago). 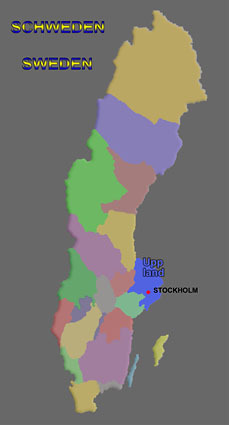 Stockholm, founded in the 13th century, is situated on 14 Islands, where the Mälar lake is connected to the baltic sea/archipelago. Slussen is the interface between salt- and normal water and separates Gamla Stan from Södermalm. A very good view you can get from Katarinahissen at Slussen. Nice cafes can be found where you can sit outside during the - compared to Germany shorter - summer.Or boat trips, e.g. to Vaxholm with restored steamboats where you even visit the engine room - a lot of activities are possible. In Södermalm you will find Globen - the largest event center in Sweden, looking like a gigantic ball planted into Earth. The name comes from Globe, it offers place for 16000 visitors. In Norrmalm on the other side of the city you can find the sins of social democratic cityplaners, who in the 60s renovated the quarter with the result of officetowers. Sergels Torg and the Kulturhuset with its galleries, town theater, library and restaurants located there - in modern style - also derived from that period. In Vasastaden you also find food and culture, but less expensive than Gamla Stan, a little bit of "multi-culti", and more silent. Östermalm, the area of the rich, also is the location for the stock exchange. More intersting is the Saluhall though, a covered market from the 19th century where you can find anything delighting the palate - a tremendous variety of different food from cheese to caviar - and you might meet the Queen. In Sturegallerian shopping and lifestyle can be found, inclusive the luxury bath Sturebad. Dramaten is the right place for you if you are looking for Swedish theater and in Kungsträdgården (the kings garden) invites for a walk - or in winter iceskating. Don't be too dissapointed - due to the mass of people this area can well be slightly garbagged every now and then. Here you find also the Swedenhouse - the biggest Tourist Information (Hamngatan 27, Kungsträdgarden). I can recommend a visit of a cafe named "Sturekatten", to be found in Riddargatan 4. A really classic type of Stockholms cafe's on three floors with nice food and open atmosphere, where you can find anything from "high society" to students. On the museum island of Skeppsholmen an old sailboat - the AF Chapman - was renovated to act as youth hostel nowadays. Gamla stan (the old town) as the medieval highlight (13th century, but most buildings are from the 16th to 19th century today) on the island of Stadsholmen, offers phantastic views of alleys, stairways, arches and places (and good cafes with the famous, very sweet Swedish art of baking) - and every possibility of buying cuddle toy mooses or any other souvenir reminding you of the beautiful city. 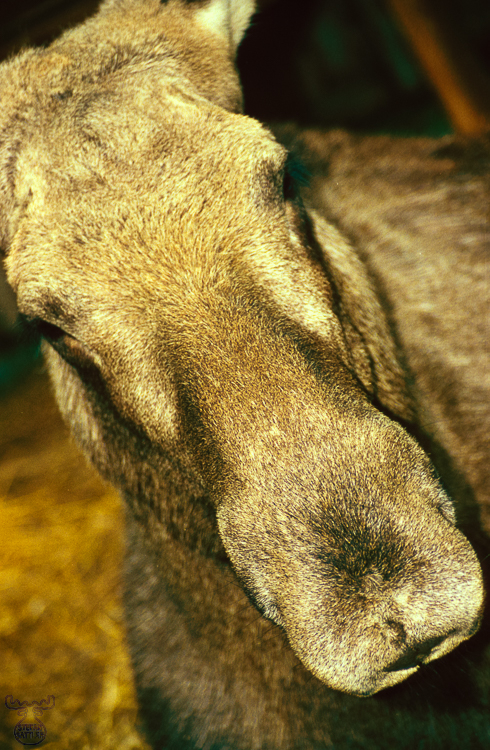 (I have approximately 10 different of those mooses at home in the meantime!). It reflects Swedish romantic, which could escape the renewing actvities of town planers in the 50s just because they ran out of money (luckily). 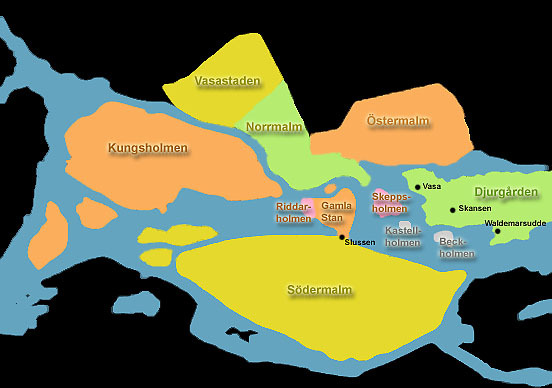 Gamla Stan is situated on a rock island in the Mälar lake, therefore there is never a long way to the water. The street called Västerlångsgatan as the most populated one is offering a range of goods like Norwegian pullovers and souvenirs, but also pubs and restaurants frequented until late night. 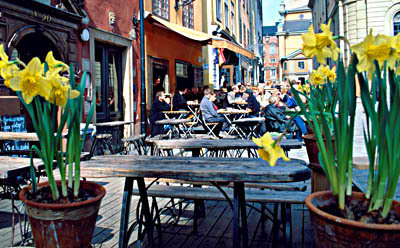 The Stortorget with its cafes and restaurants at the large place reminds of Italian Piazzas. 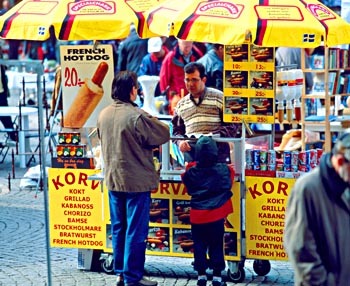 The snackbars, which provide sausages ("korv") and hot dogs on the streets and places can be found nearly everywhere in the town. A walk starting from the subway station T-centralen taking the shopwise well equipped Drottningsgatan, through the impressing building "Riksdagen", passing the "Kungliga slottet" (kings castle) into Gamla Stan is a good point to start a Stockholm visit. At the southern end of Gamla stan, passing the "Järntorget" you reach "Slussen", the lock, dividing the freshwater of the "Riddarfärden" from the baltic sea. From Slussen (not so interesting) you can take a short ferry trip to Djurgården, the fee is included in any public transport ticket. Djurgården is the museum island with many villas. 10 minutes from Gamla stan you can find Kungsholmen, a quarter for living and working. And situating Stadshuset, where the Nobel price is awarded in December. One of my favorites is Skansen (www.skansen.se)- an open air museum and zoo spanning over 300.000 square meters on the island of Djurgården. Over 150 traditional Swedish houses from rural Sweden were rebuilt in this world's oldest open-air museum, many of them are inhabited by tradionally clothed persons during opening hours and expecially in summer time. In winter time you won't find so many of those "actors" telling you about the former times, living conditions and the buildings. But Skansen after the snow has fallen is beautiful, also for reason of photographing. The animal park in one part of the area giving stupid German tourists (like me) the chance to get close to the kings of the forest - moose! And those ones are quite familiar with human beings, who seldomly have guns with them like those out in the real forests. Therefore there is a good chance for scratching them behind the ears - you shouldn't try with the wild colleagues of them! Many other North European animals such as seals, wolf and wild boars, can be found here - also good coffee and cake in the tower close to the animal area. Also to recommend: The "stadskvarteret", the towns quarter, with different shops and businesses, where, especially in summertime, you can watch craftsmen in historic dresses at their job. Djurgården offers also wonderful walks at the water and many outstanding museums, e.g. Vasamuseet (www.vasamuseet.se) - a 17th century, restored sailboat granting a view on the sailors life of that time. We don't need to mention , that the boat sank on its maiden yoyage in 1628. It was brought back to light 333 years later. Worth a day! Also not far away : Waldemarsudde, home of Prince Eugen (1865-1947) - the "Painter Prince"